Pull the tab on the velcro strap that holds the string in place. Unwind 20 feet or more of line and let it drop to the ground. Stick your first two fingers into the loop on the strap end of the rope. Put your right hand thumb into the thumb indent. Pretend you are in the left hand batters box on a baseball diamond and want to throw the disc to the pitcher 90 feet away. Pull your right hand back behind you, like you would if you had a bat ready to hit a pitch, rotate your shoulders back like a wind up with a bat. When you throw, pull the disc in a straight line across your chest and extend your arm pointing at the pitcher who is your target. Keep the disc horizontal (parallel or level to the ground) as you release it. When you release the disc at the end of the throw, your wrist will snap the disc and cause it to rotate shedding the line. Click here for an instructional video made by Fox News. If the disc curves left : You had it tipped down when you released it. If the disc curves right: You had it tipped up when you released it. When it goes straight, you had the disc level when you released it and will get the best distance and accuracy. In an emergency, when you are not able to walk laterally to pull the disc to the victim and need to re-throw, just put 6 wraps of rope on the disc and leave the rest on the ground. Throw as before. For 50 foot re-throws, throw the disc without re-winding the rope. Loop the ends of 2 disc into each other and form a knot. Unwrap 50 feet from the 2nd Disc, dropping it to the ground. Leave all the line on the throwing disc and it will take the line on the ground and unwrap all the line from the thrown disc. Using this technique, you can throw the disc 135 to 140 feet. Some Disc Golf Players can reach 150 feet and more. The more you practice, as with any skill, the better you become. If you are left handed, reverse the batters box. In addition, right handed throwers wrap the rope on the disc clockwise facing the label, while left handers wrap the rope counter clockwise. Do not throw the Disc at hard surfaces such as trees or buildings. 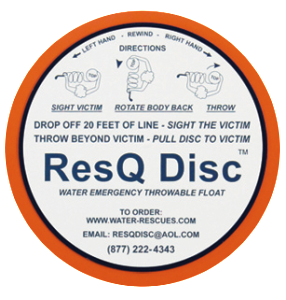 Use the Disc only in actual rescue situations. For ICE RESCUES have the victum put the disc between their legs and turn the disc 90 degrees and cross their legs on the disc. Then have them use their free hands to climb on the edge of the ice while you pull them up from a sitting position. If you need additional tips, or are having specific problems, please contact us.